"O" Cirque Du Soleil discounts - Hotels Etc. Cirque du Soleil weaves an aquatic tapestry of acrobatics, synchronized swimming, surrealism and theatrical romance in the timeless production, “O.” Exclusive Access to Preferred Seating! 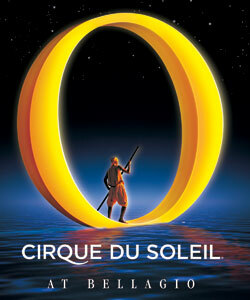 Cirque du Soleil paints an aquatic masterpiece with "O". The international cast of world-class acrobats, synchronized swimmers, divers and surreal characters perform in, on, and above water to create a breathtaking spectacle. Inspired by the concept of infinity and the elegance of water’s pure form, “O” pays tribute to the beauty of the theatre - from the simplest street performance to the most lavish of operas - where anything is possible. Only at Bellagio in Las Vegas. "O" is performed Wednesday - Sunday at 7:30pm and 10:30pm. Ages 5 and older are welcome.